Melanie Nezer, senior vice president of public affairs for HIAS, the global Jewish nonprofit that protects refugees, addresses faith leaders, advocates and refugees at a World Refugee Day rally co-sponsored by HIAS on June 20, 2017, in front of the White House. An activist holds a welcome mat at a World Refugee Day rally co-sponsored by HIAS, the global Jewish nonprofit that protects refugees, in front of the White House on June 20, 2017. Aleksandr Galkin (L), HIAS representative in Ukraine, joins the Canadian Ambassador to Ukraine and representatives of the UN High Commission for Refugees and refugee communities in Ukraine for the opening of a new photo exhibit in Sophia Square, Kyiv, Ukraine, June 20, 2017. A new photo exhibit in Sophia Square on the life of refugees in Ukraine and the history of Canadian hospitality and refugee protection, Kyiv, Ukraine, June 20, 2017. Dance performance by local women’s group, Pa’ lante con esperanza (continuing with hope), at a World Refugee Day fair in Guayaquil, Ecuador on June 21, 2017. Buñuelos and Pan de leche, two traditional Colombian pastries, are sold by a refugee entrepreneur who participated in the World Refugee Day entrepreneurship and integration fair in Guayaquil, Ecuador on June 21, 2017. Mr. JG, a Colombian refugee and HIAS client, enjoys the World Refugee Day fair in Guayaquil, Ecuador with his son on June 21, 2017. With support from HIAS, JG started a business making plantain snacks that allows him to support himself and his family. Refugee advocates in New York City march in opposition to the refugee ban as part of a World Refugee Day action organized by African Communities Together, HIAS and other City of Refuge Coalition partners, June 20, 2017. Refugee advocates march in opposition to the refugee ban, New York City, June 20, 2017. Attendees at the World Refugee Day Festival at the Brooklyn Conservatory of Music dance to traditional Syrian music, June 10, 2017. Kathya Araya, Country Representative for HIAS Costa Rica, gives a World Refugee Day briefing for clients at the HIAS Costa Rica office in San Jose. June 20, 2017. In Washington, D.C., hundreds gathered in Lafayette Park, just outside the White House, to rally in support of refugees and call for their continued protection. Those present included refugees, faith leaders, legal and security experts, and community activists. “World Refugee Day is about who we are as a country and what we stand for. We must choose to welcome refugees seeking safety for themselves and their children, and not turn our backs on people who need our help," said HIAS Senior Vice President of Public Affairs Melanie Nezer in remarks at the rally. The speakers were diverse, but they shared a common message: respect for refugees and their contributions to this country. “Refugees make America strong, and diverse, and beautiful. They make us who we are," added Sirine Shebaya, a senior staff attorney at Muslim Advocates. The Washington, D.C. rally was one of many World Refugee Day gatherings around the country—and around the world. In New York City, dozens of advocates marched in opposition to the refugee ban, and gathered for an interfaith iftar dinner at Dag Hammarskjold Plaza as part of a World Refugee Day action organized by African Communities Together, HIAS and other City of Refuge Coalition partners. In San Jose, Costa Rica, HIAS Country Representative Kathya Araya led an information session for refugees and asylum seekers on World Refugee Day, to explain their rights as well as the meaning of the annual commemoration. "It is important that all humanity be aware that there are people who suffer persecution and need to be Welcomed. Feel welcome in Costa Rica and in HIAS,” Araya said. In Kyiv, HIAS Ukraine joined the UN refugee agency and the Canadian Embassy to host a photo exhibition in Sophia Square, right in the heart of the capital. The exhibition, named “Show Humanity!”, features both the life of refugees in Ukraine as well as the history of Canadian hospitality and refugee protection. Some World Refugee Day celebrations across the U.S. this year were particularly innovative. 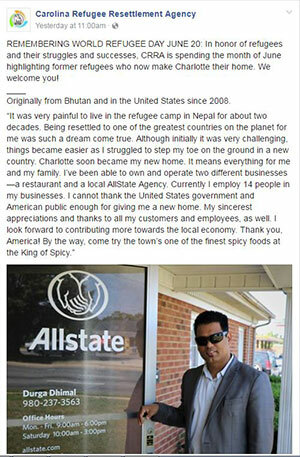 CRRA, HIAS’ local partner in North Carolina, spent the month of June using Facebook to highlight former refugees who now make Charlotte their home. HIAS New York, together with several former HIAS clients and HIAS staff, marked the day early by attending a World Refugee Day Festival and the Brooklyn Conservatory of Music on Saturday, June 10. Artists performed classical and folk music from their native lands in groups and in solo configurations. Proceeds went to the Brooklyn Conservatory of Music New Overtures Fellowship, which aims to provide professional development for refugees, immigrants, and asylees seeking careers in music education in New York City. To stay up to date with HIAS, follow us on Facebook, Twitter and Instagram.